Soccer becomes more than a game. The mission of One By One Costa Rica is to make permanent change in the lives of teens who need more positive opportunities or have had problems with crime, drugs or homelessness. We want to share with you the amazing work that is going on in Costa Rica. On our Stories page, be inspired and join us in this journey. In partnership with Vuelo de Aguila church. 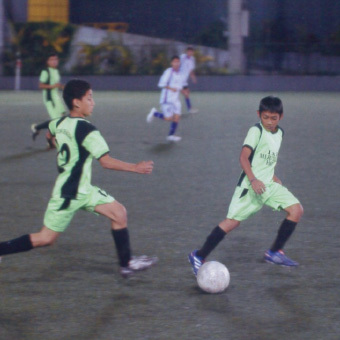 We have established a soccer league in Costa Rica to give teenagers, who could otherwise not afford it, an opportunity to play soccer, and use the sport as a gateway to learning about personal responsibility, leading a Christian life, and ultimately defining the path they want to choose for themselves. Founded in 2010, One By One sponsors soccer teams in San Jose, Costa Rica and supports the activities of the Vuelo de Aguila church, whose members train and mentor the teenage players (both boys and girls). Last year we made our 12th annual trip to Costa Rica to visit our friends at the Vuelo de Aguila church in San Jose and to plan for the future of our youth and church programs there. One by One Costa Rica started with the desire over 12 years ago to help at-risk teens in San Jose "one by one." Over the years, through the joint efforts of the Wyatt and Lee families and Pastors William and Anais Padilla, we have been able to operate a free soccer league to draw at-risk teens in and then provide them with support and mentorship from Vuelo de Aguila church members, who also coached the teams. At its height, the church sponsored three boys and one girls teams. Members of these teams have since become members and leaders of the church. Many have gone on to secure an education and jobs that allow them to be productive members of the church and community, and many of them are close friends. Several years ago, we all realized that the church needed a permanent home, and we raised funds to buy a church building. Dr. Steve Scott and his wife, Rebecca, were instrumental in this effort by providing a loan for the building. Through a lot of hard work and fundraising since then, and because of Dr. and Mrs. Scott's generosity, we were able to pay off the loan this year. This means that the church now has a solid financial foundation to carry out its mission and outreach programs. One by One started with an idea formulated in a vacant soccer field in a barrio in San Jose, and has now come to beenfit many teens and their families, but always "one by one." One by One Costa Rica was founded and has expanded over the last decade because of the partnership consisting of Daniel, Ben and Amelia Wyatt; Alex and Cammie Lee; the Wyatt and Lee families; and our close firends at the Vuelo de Aguila church, including Pastors William and Anais Padilla and their children (LeeAnn, Willi, Keren, Daniela and Isaac), and many other church members. The future is full of promise to continue positively affecting the lives of others in San Jose, to continue the Christian mission of the Vuelo de Aguila church, and we are looking forward to taking our 13th trip to Costa Rica soon! What started as an idea just over 6 years ago has turned into an amazing reality. And the reality is that of hundreds of kids' lives will be different. But not because of what we have done, but because of how God has used each of us. Would you consider being a part of this exciting journey with us? Thanks to our generous donors, we've seen tremendous growth in just 6 short years. Fundraising has gone from $16,000 in 2011 to $563,000 in 2014. That's over 3,400%! And some pretty amazing things have happened not only to grow the program and church, but life change is happening in the community.